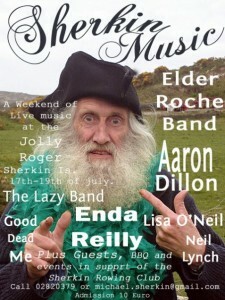 The Sherkin Festival was brilliant last over the weekend at the Jolly Roger Pub on Sherkin Island, Baltimore. Can’t wait to go back sometime soon. It was great to see Elder Roche, Aaron Dillon, Lisa O Neill, Good Dead Me and all the other musicians who played in the sessions on and off-stage. Thanks to all in the Jolly Roger for a great weekend! You can get your ticket for Knockanstockan the Knockanstockan website www.knockanstockan.ie through paypal or at the Knockanstockan Shop in Eamonn Doran’s pub in Temple Bar. It’s on the 24th, 25th, 26th of July and is €65. I haven’t got my exact stagetime yet but you’ll be the first to know when I find out. Here are this weeks Free Tracks. More in the Free Tracks section. What's with the FREE Live Tracks? So here’s the plan. You come and take 5 FREE Downloads (and tell all your friends of course) every monday, if you’d like to. Then have a listen and come back when you can, to vote on which ones you really liked or leave a comment. Then when all 36 of the FREE Live Tracks have been digested and the votes come in, I’ll see which ones got the most votes and positve feedback and I’ll make a live Album out of it. So you guys get to do the choosing. How does that sound? Let me know if I’m Crazy! We did a gig last night in Whelan’s supporting Caracoles. Thanks to all who came down and to the band who played a stormer. I really enjoyed the set and had a great time. The Cabaret Craiceáilte was great fun. Really good evening of traditional music and songs as gaeilge. Many thanks to Gary who played the Congas with me. I played 40mins of songs all as gaeilge including some songs I’ve never played before, such as An Spailpín Fánach, and my own new ones Dónal ná Fág and Ceol as an Dorchadas. The music for the rest of the evening was a masterclass of trad with Séamas Begley, Mairéad ní Mhaonaigh and Donogh Hennessy who played amazing guitar with them and The Campbells who had stories and tunes to beat the band. Bhí am iontach agam ag an Cabaret Craiceáilte i dteach Húdí Beag i Bun Beag, Gaoth Dobhair. Oíche den scoth a bhí ann le ceol trad agus amhránaíocht as gaeilge. Míle buíochas le Gary a shein na Congas liom. Sein mé 40 nóim de amhrain as gaeilge maraon le cúpla cinn nua ar nós an Spailpín Fánach agus mo rianta nua Dónal ná Fág agus Ceol as an Dorchadas. Bhí sár – cheol don chuid eile den oíche ó Séamas Begley, Mairéad ní Mhaonaigh agus Donogh Hennessy a shein ceol den scoth ar an guitar leo agus Na The Campbells, a raibh scéalta agus portanna deasa acu.